In her complaint against the retailer she alleged there was a foreign substance on the floor inside the store. She said the store management was negligent in allowing the substance to accumulate on the floor in June of 2013. She claims the liquid caused her slip and fall in manner that resulted in substantial physical pain and suffering. She specifically alleged defendant was negligent in allowing the liquid to remain on the floor, negligent in failing to warn customers of the wet floor, and failure to dry the floor. As part of her civil personal injury lawsuit, she is demanding damages for pain and suffering as well as medical bills in the amount of $75,000. 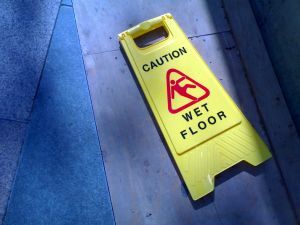 It should be noted that defendant has not been found liable in any way in connection with this alleged slip and fall personal injury. While it is not know if this particular case will actually go to trial, many might be surprised that it did not settle quickly. In reality, large corporations and not always so willing to settle cases so quickly as one might think. It is a commonly held belief that it would cost more to defend one of these cases than it would be to simply make a reasonable settlement. This is not a misconception in every case. In fact, the companies are aware of this as well, but they may be worried they will set a bad precedent. The tend to fear that if they pay a settlement too quickly, many more people will come out of the woodwork and say they slipped and fell as well. The best thing you can do if you are injured in a slip and fall accident in Boston is to speak with an attorney who regularly handles these types of cases involving large corporate defendants. You also want to make sure your attorney will actually be willing to take the case to trial if necessary and fight for your fights to a full and complete financial recovery. It is also helpful to speak with an attorney as soon as possible. A big box store generally has many cameras and there is a good chance the entire slip and fall incident was recorded. However, if the retailer is not served with a preservation letter from a personal injury lawyer, it may not keep the recording. If you have an experienced personal injury, one of the first things he or she will do is to send an investigator to the store and work on preserving and obtaining footage form any security cameras. Another thing that is very help to increasing your chances of a full and appropriate recovery it make sure you immediately your injury as soon as it happens to store management. This will ensure that an accident report is generated and paramedics are called to access your condition and offer any medical attention that may be necessary.